Aging falls within the natural order of the physical universe. Aging is really just reconstruction. One form replacing another, being replaced by still another format. We accept change more easily with objects wearing out, than with our physical bodies wearing out, even though we know that the elements in objects that are worn out become in some way part of another object in the future, as atoms are ageless. The atoms composing all creation continue on and on, alternating in cycles of solidified and free energy, seen or unseen to the human eye. We don't as easily accept the changes aging causes in our own bodies. Even if we resist the obvious process of change, change still happens. With us, the natural evolution is that as our physical body deteriorates, we feel the internal incentive to begin developing our consciousness. We begin the journey of exploring our timelessness. So the aging of our body is not a loss to us in the long run, it is a motivation for us to explore and expand in awareness of our soul's agelessness. Others who observe the aging of our bodies are not necessarily aware that we may be regenerating, changing for the upward evolution of our internal and eternal conscious awareness. They do not realize that we are growing still, not in physical format, but growing into our expanded Self, our self that is an integral and eternal vibrant link in the entire seen and unseen creation. But as we notice our bodies aging, it is our reminder, literally our wake-up call, to put our energy into the development of the esoteric qualities of love, kindness, caring - those qualities that expand our personal awareness of our interwoven life within all other life. When our current physical body ages so much that it no longer functions as the house for our mind and soul, we take up residence in an unseen but still conscious format in our progression in agelessness. In format seen, format unseen, we continue on with unbroken consciousness of ourselves. Acting for our own and others' highest good, is the best way to show we care. It is from the feeling that we are interrelated, intermeshed within creation, that we naturally act for the highest good. Eventually, we feel so comfortable interacting with others, that we realize that no one is really alone in consciousness. Living and acting for the highest good of the situation is a process of processing, we take in, mull over, and come up with something different. And in that middle space we digest and integrate new insights into our consciousness, or we suffer indigestion by only partially understanding and analyzing what is going on with us and the situation. line with our highest thoughts and words, we purify our mind; pushing out undigested remnants of our past. As these old issues come up to our conscious mind, they can be burned up by our most current consciousness of what living for the highest good means to us. It is more of a challenge to show care and love with 'difficult' people. Their actions, or what they say, screech across the grooves in our mind, and we get uncomfortable feelings in our body while with or thinking about them. - Or, doing the opposite of being the mental observer, by being surrendered and open to their form of expression, allowing new grooves of a different reality to be recorded in our mind and stored for reference. During this new recording, we do not have to give up our own position or way of thinking; we are expanding our own experience base. Difficult people have yet to have contact and personal experience with their underlying state of harmony. If we are the one others label 'difficult' and now want to get along with others harmoniously, we can take stock of the way we are handling situations in our life. We mainly learn by trial and error. After we have continual problems in relating harmoniously, we begin to ask ourselves why. After the reasons outside ourselves are exhausted, we are more motivated to begin personal self-improvement. This is usually the last resort, but the right place to get to know our underlying happy self. The sincere desire to know about ourselves, our Source, leads to experiencing our underlying harmony; which imbues our subsequent thoughts and actions with harmony. We begin having easier relationships in all aspect of living. Beautiful uplifting music is made up of the harmonious blending of separate notes. We are each like notes of music, acting in phrases; and when conscious of our grace and balance, we form melodies and symphonies with everything around us. In closing, when we see people who have a mental or physical condition that does not allow them to communicate themselves clearly through their body, they are in transition. This transition phase can go on interminably by our standards of 24 hours a day, but on the eternal clock it is but a short moment. Everyone, aware or not, lives in agelessness. Change is not failure. Rather, change using new information to get us to our destination more easily is the most efficient path on which to proceed. Even change many times on the way to our goals when a clearer way becomes visible is the best course of action to follow. The need for course corrections can face us at any stage in the progress of any goal we are seeking, even when we are deeply entrenched along a specific path. Allowing course corrections makes use of our intelligent, discerning, and creative faculties. We are given these aspects of mind to be able to adjust ourselves to changing circumstances and conditions in our lives, including career goals and relationships. When we become aware that another action would be for the higher good of a situation we need to make a course correction to maintain our balance of peace of mind and an easeful body. Our ultimate path in life is to act so that we maintain peace of mind and an easeful body while growing in consciousness of the whole of ourselves. And the whole of ourselves is not limited to our body, mind and emotions. It is the knowing that we use our body in action, our mind in creatively solving life's problems, and our emotions to show care as tools to get to know our infinite soul. Our soul, having far-reaching roots that are sunk in the infinite Spirit, invisible but ever present, experienced through the portal of our heart by our actions of unconditional love. When we awaken each day we have the opportunity and choice to live in a way that we can enjoy, that will bring joy into our life. And this is by acting for the highest good of each situation that the day presents. By acting for the highest good we are assuring ourselves peace of mind, peace of mind and an energized body. The circumstances we are in from day to day may be repetitive and similar, but our own attitude and actions make the day painful or joyful for us. By our own attitudes and actions we are in charge of the outcome of each situation. When we are given lemons, we have the opportunity to make lemonade by 'sweetening' the outcome. We do that by taking one little nugget of truth out of an uncomfortable situation, and then using it as a stepping stone for improving the day's unresolved or inharmonious conflicts. By doing our part to be positive and constructive, by doing our best, we enjoy our native natural peace and ease. Conflict about what to do arises when we want to go with an idea we had our mind set on, before we have considered all the options. The best solution is not always the easiest way. We must have courage, summon up our energy by will power, and make affirmations to do what is best in each situation so that we can maintain peace of mind every day. It helps to remember that we will be living with the results of our decisions. When there is plenty of time to consider, write down all the options that come to mind. Make a pro and con list; then choose the course to follow. By looking at a problem as just an object, we create a little distance which gives us the perspective of seeing that the problem is an issue to be resolved that we are involved with, but that it is not part of our permanent being. If we feel agitation in our body or mind we can use mental and bodily relaxation techniques such as meditation, regulated breathing, hatha yoga, and walking to calm ourselves. While feeling calm we can reflect on the internal cause or causes of our unrest. After reflecting on the reasons and circumstances leading to our agitation we can best consider and plan how to make changes in our life that will allow us to regain our center of balance. By living in our center of balance our body feels energized and healthy, and our mind is calm, clear, and full of inspiration with the outlook that will serve the highest good of ourselves, others, and all creation. Living in our center of balance allows us to experience our true self as an embodiment of joy. In joy we are energized and inspired to think, speak and act for the highest good as we go about our daily lives. As positive thoughts return positive results, and positive actions return positive reactions, we are ensuring ourselves of an uplifting daily life. Science has shown that people who impose the least stress upon themselves live the longest - and those that stress themselves die earliest of stress-related disease. The people who handle stress the best also enjoy life more fully. Healthy stress or 'unhealthy' stress? Healthy stress lets us know that something needs to be resolved. Healthy stress turns into 'unhealthy' stress from not dealing with the something that needs to be resolved in a positive and constructive manner. What we need to do is deal with stress as temporary situations knowing they will eventually have a resolve. Daily activities, by their very nature of action, are not serene in themselves. We can try,but it is physically impossible to make our actions serene. What we can make serene is our mental attitude while we are being busy and active. Serenity in the present comes from remembering that in the past every problem had a resolve. And, that therefore, every dilemma of the present moment and all future moments will have a resolve, also. If we truly keep this idea in mind we need not stray too far before recapturing our serenity. Freshly energized, our attitudes and perceptions clarify and sharpen. The grit of indecision and staleness fall away, just as a whirling strainer throws off chaff, preserving the nutritious kernel. It takes initiative to get going. When feeling low, if we will take a moment to think back about how good we have felt during and after exercising, we will have the incentive to get ourselves out and energized again and again, relieving our down attitude and mood. These opposing energies interrelate,cooperate, causing motion, the flow of energy. Some energy solidifies, forming physical matter; some is felt, but unseen, as in heat and electricity. When confronted with adversity in other people we can retain our peacefulness by assuming a neutral position. Example: While driving a car, we can go forward, backward, or remain in neutral, as at a stop light, to avoid a collision while traffic crosses our path. Adversity in people, or a situation is 'cross traffic'. Allowing their opposing energy to go by, while remaining in neutral, keeps us out of an 'accident' of conflict. Our self-centeredness tempts us to pull out of neutral into conflict because we feel our point of view is being jeopardized. But, within the negative or opposing side of peace, there is no resolve that serves the highest good. Decisions out of strife fail, as they are not born of balance and harmony, nature's way to maintain universal order. By upgrading our self-centered feelings into caringness, we relax and regain our sense of balance and harmony. Evolution is a natural building and tearing down process that makes space for refined and redesigned structures. A relationship fails to be a relationship when one or both can no longer grow within the current set of circumstances, conditions, and interactions. It is okay to begin rebuilding with a different set of circumstances and another person. We again take up our threads and begin reweaving a new and more refined pattern into our relationship cloth. It is the natural evolution. It is a tapestry whose threads are as pure liquid silver, whose lightness and lovingness is eternal, and indestructible by mortal happenings. This kind of relationship is created when we live our life lovingly for the highest good of ourselves, and simultaneously for the highest good of the relationship. The pain of disintegration is a fiery refining process. Consciously allowing, surrendering, and letting go of an unworkable relationship forms a bridge to a better life for both. Why are we Impatient and Intolerant? But where does happiness lie? We have more energy to enjoy life by maintaining our balance. And following the directive of our conscience keeps us steady in the saddle of life's galloping horse. In order to hear our conscience, we need a healthy body, calm mind, and positive loving attitudes. Living should be a balance of work and play, incorporating caringness. By maintaining our balance, we most easily hear our conscience telling us the surest, safest routes to use for the many adventures we take down the road of life. We feel best, happiest and satisfied by keeping on course while journeying. Feeling relaxed and safe in our body allows us to confront any issue or person who disagrees with, or threatens our values. Everyone and everything influences us, but we have free will to choose our reactions. We fear an encounter when we feel we will have to give up our position or attitudes, or be coerced into doing what feels uncomfortable to us. Before confronting a conflict we need to remember what our body felt like when we were enjoying an activity, relive again the warmth circulating throughout us. We are in control and master of our actions and reactions. We can practice feeling this way by just bringing a happy thought to our mind, while in a safe setting. When a potential conflict threatens, we need to remember what our body felt like during our practice session, and then relax into that state of consciousness, feeling whole, complete, and safe in our body and in control of our mind. No one can influence us without our permission. We are entitled to our own ideas and values. We do not have to take on uncomfortable or unacceptable ideas. We must use courage to preserve our ideas and integrity. Bravely, while feeling safe and secure in our body, we should confront those issues holding us back from freely expressing ourselves in the world. We each can and must learn to be courageous in order to expand and experience our humanness within humanity, fully. Children show courage from infancy, putting forth great energy in their struggle to reach adulthood. It takes courage to do anything new, to keep expanding. Sometimes, as adults, we reach a level of comfortableness, coping with life sufficiently well to just stop putting forth more effort into growth and expansion. But why be content to live short of the mark? Courage requires a positive attitude, opening us, exposing us to the vibrant energy of our inner Source. When we feel this vibrancy energizing our body we feel we can soar. We feel the strength of will to overcome what we have been resisting. Positive attitudes bring up the energy within us to again be courageous, as we once were as children. As adults we have learned the keys to survival. We now have time to reach for the fulfillment of inner awareness, time to search out our roots of existence and human-beingness. Courage. Let's use its energy to search out and discover more profound levels of consciousness by becoming an inner explorer. Sincerity is having the full intention of carrying out our words as promised. We often shade our feelings and thoughts. It requires courage to say and act upon our convictions, but sincere communication achieves our goals most expeditiously. We avoid roundabout explanations. And others see us as stable and trustworthy. In our words and actions, sincerity allows us to relax, because we are acting from our true Self, our Self that knows and acts on truth. And when we are relaxed into the saddle of life, firmly mounted in the seat of our Self, others around us relax more, too. One hour may by 60 minutes, but we can make it more valuable, liquid silver, by increasing the quality we put into that 60 minutes. All aspects of living can have the quality of liquid silver if we always act from our highest consciousness. Each moment we use our free will to decide how to act. We can upgrade, viewing our time as precious silver; or downgrade, viewing our time as dust, to be whisked away. Our choice. During the journey of living we should enjoy what every moment holds, without putting off our goal of happiness or fulfillment for the distant future. We limit our opportunity to enjoy the present by thinking the future will be better. Self-knowledge: Knowing and being able to draw from our inner Source. Self-knowledge forms the foundation for building a happy, fulfilling life. When our actions are inline with the highest good we are contributing to our sense of wholeness and well-being, just as a house built upon a foundation with straight and true lumber creates a framework that perfectly supports its visible outer coverings. Self-knowledge is like drinking from an ever-flowing spring of clarity. When we need guidance in any situation, the way that preserves our personal peace comes to mind. It is an open telephone line, directly from the pervading universal cellular harmony to our conscious mind. The more we converse on this open direct line to our all-knowing Source, the more we can use and incorporate these directives reliably. After awhile, the flow becomes so integrated into our waking consciousness, that the best resolve is automatic. This is open communication in its purest sense, the ultimate application of self-knowledge. Personal integrity is living in accordance with our highest state of consciousness. We continuously create our reality by our choices, moment to moment, creating and maintaining harmony by following our conscience and acting for the highest good. Through living with personal integrity, others notice that we can be trusted. We become a trustworthy friend, an asset to our world family. Caring beyond ourselves brings warm-feeling energy into our body, into our waking consciousness, to be used in our interactions. Lovingness propels us to break free from the idea that we have a limited supply of mental, emotional, and physical energy. Our inner guide, our conscience, is awakened and developed by our being unconditionally loving in our daily living. As we incorporate lovingness into every circumstance in living, we preserve our awareness of harmony and connectedness as interwoven threads in the cloth of creation. Life is a long series of transitions, moment to moment, hour to hour, day to day, birth to childhood, to adulthood, to death, to after death. We can easefully flow and allow change as it naturally occurs, and in this way grow in fullness and maturity, ripening well as fruits on the tree ripen and share with whomever need them. Or, we can mentally, emotionally, and physically resist the changes, which happen anyway. Conscious transitions lead on an upward curve into greater awareness of our whole composite nature, which is powered by a permanent electric-type energy that we call spiritual energy, sustaining us through all the transitory moments of eternity. It makes more sense to observe mother nature and note that all physical forms only change from physical to energy to physical to energy over and over again. No atom on any plane of existence is ever lost, only in one of its various momentary forms. We can't see energy with our physical eyes so we think that when a physical form disintegrates it is gone forever. Nature itself disproves this. Physics disproves this. The physical has only made a transition to the invisible energy and will probably come into another physical form some day. When we sleep at night our waking consciousness withdraws from the sense organs, rests, then returns upon waking. Later that day consciousness again withdraws. We survive that transition of energy being in our limbs to energy being withdrawn from our limbs, back and forth every day. We do not experience any discomfort or sense of loss as our senses withdraw and we fall into sleep. We continue on. We easefully make the transition every day. From these observations we see that all life continues on, only its visible form disappears from our physical sight. We can feel our unseen oneness with our family and friends, feel our unseen ties at this moment, those ties not dependent on anyone's physical presence with us, when we are feeling the energy form of manifestation that we call love. What changes is changed, there is no reversing. We can use our free will to either resist, or adapt gracefully. During trauma it is okay to allow ourselves to feel and express naturally. Knowing that there will be a level plateau ahead for recuperation, allows us to express ourselves fully, as befits the current situation, and then go on. Body, mind, and emotions are tuned to a higher pitch during transitions, drawing on our reserves. To do what is unfamiliar takes more concentrated energy than repeating habitual actions. We can draw in fresh energy to help us keep up with above normal need by increasing aerobic activity, and upgrading our store of energy through deep relaxation and meditation. During major transitions, such as the death of a loved one, keeping some familiar habits in our daily routine provides us continuity and stability, giving the untraveled road ahead an underlying stable base. If we feel agitation in our body or mind we can use mental and bodily relaxation techniques such as meditation, regulated breathing, hatha yoga, and walking to calm ourselves. While feeling calm we can reflect on the internal cause or causes of our unrest. After reflecting on the reasons and circumstances that led to our agitation we can best consider and plan how to make changes in our life that will allow us to regain our center of balance. Why do we visit earth? At our beginning on earth we come as pure, clean canvasses. As our own artist, we fill up our canvas with our impressions from living. Some impressions we retain because they are beautiful to the inner eye, our conscience, and some aspects we refine till the entire canvas is a completely balanced, beautiful, inspiring masterpiece. The blank canvas was clear, but by our good deeds and expanded consciousness the completed masterpiece is radiant. words, deeds, or even thoughts. Thought vibrations travel between us over unseen paths, as the law of this universe is that for every action there is a comparable reaction. When we initiate good acts, our reward is that good experiences happen to us. Initiate an evil or negative thought, word, or deed and the reward will bounce back as an unhappy or painful event. Like for like. In this light, if we keep a positive attitude and help as opportunity arises, we will feel good in the moment and set the stage for further positive happenings. 2. Spending time in meditation: A still body helps still our mind. In the stillness of meditation we come to observe an inner vibration apart from our physical sense of hearing, and apart from our thoughts. Tuning in to this always present, constant, self-sustaining vibration calms us even more. The peace attained by observing this inner sound allows our mind to become very calm. Then we are able to listen to our inner voice of conscience which knows right from wrong and what is for the highest good of all concerned in our present dilemma. So, by following the golden rule and by meditating, we set the stage for our balanced development and add to the beauty of the masterpiece of our lives that we are creating. When we keep a positive attitude in following the golden rule, we are more likely to see good solutions. A simple chore is boring to some and joyful to others. How can this be? The action performed is the same. The difference lies in one's attitude. When performing actions with only thoughts of how we ourselves will benefit, we don't find lasting peace, contentment, happiness. Self-centeredness causes our mind to continually think of ways to please itself. No feelings of joy are felt because the whims of the mind preoccupy our time. When we perform our daily work with the attitude of caring, we feel good. Just the attitude of caring draws energy into our body. The more caring we become, building up our level of happiness, the more we see the wisdom of our positive actions. Wisdom provides a wise dome. The dome covers us with a shield against wrong action. When wisdom is achieved, the right easeful way seems the natural way. A way to project wisdom right now is to have caring feelings for all people and the creation. When we act from our heart, we do what is best for all. When our mind is clouded by selfishness we can not make the best decision. When we act from lovingness we are doing only good. Purity is another quality that contributes to us creating a beautiful masterpiece of our soul. Purity is the highest level of consciousness we can realize. It is the eternal essence of each atom of us and the universe. When a cut glass crystal is squeaky clean, sun light shining through reflects out perfectly. When our mind is cleaned and purified by right living the divine light reflects out perfectly. The divine light serves as a beacon and model to all. As a lighthouse beacon shows ships the way to safety from a turbulent ocean storm, so the divine light shining from the pure person guides and points the way for others that they may come home safely to their full soul awareness, full soul development. Being conscious that everything we think and do has an affect on us and others, should spark us to aim for inner purity if we want to realize our easeful, peaceful Self, our soul in its fullness. 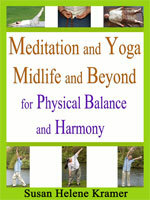 Meditation and Yoga Midlife and Beyond Ebook - For midlife and older. 30 sitting and standing poses that help the physical body maintain or regain motion balance, (as in not falling over) and remain supple. Adapted from standard yoga poses. 10 meditation techniques follow to give you a choice in various circumstances and include a meditation breathing technique, how to use a mala and mantra, sitting, walking and stress reduction meditations, and meditation for spiritual healing, developing intuition and memory skills. Yoga philosophy follows and includes a variety of virtues. Illustrated with photos of all the poses. 107 pages.